Flushometers, HET and HEU Fixtures, Water Conservation Products, Waterless Urinals, Sensor Faucets and Flushometers and Showerheads, Sloanstone Washfountains, PWT Prison Systems. Kliman Sales will have two tables featuring the latest innovative products from Haws, Franke, Sloan, and Symmons. 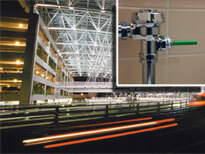 Building Operating Management, February 2009: Portland International Airport saves 177,000 gallons of water a day by installing Sloan dual-flush Flushometers.